Across The Pond Wrestling: Opinion: Who Will Conquer the Conqueror? Well, what a difference a week makes. When I originally planned this article, Brock Lesnar had just defeated Mark Hunt at UFC 200 and was at the centre of a genuine feel good sporting story. Returning to the octagon following a 5 year hiatus, Lesnar crossed over from staged combat to the real deal and in doing so proved to the world, and to himself, that free of diverticulitis, he could not only compete with but defeat a dangerous opponent. It seemed as though we would enter a new world in which WWE and UFC might share their major stars with one another, cross promoting their brands enthusiastically. Exciting times indeed. Now however, there have been allegations of doping: the USADA have notified Lesnar that two drugs tests have revealed a banned substance. Until the investigation is complete, Lesnar must be considered innocent; however, there is enough uncertainty around the man’s MMA future that any discussion around upcoming fights and the possibilities of Vince McMahon and Dana White working together seem redundant at this time. Fortunately, there is still much to discuss regarding Brock’s role in the world of professional wrestling. For while his recent MMA foray might well be a one and done deal, WWE still has some big decisions to make regarding their business relationship with The Beast. When Brock Lesnar returned to the WWE on the post-Wrestlemania Raw in 2012, he was quickly rushed into a dream match with John Cena at Extreme Rules. From there, he was reunited with Paul Heyman and worked a trilogy with Triple H and then fought CM Punk in a Summerslam classic. Throughout this time, his matches and angles were undeniably exciting- he combined the best of work and shoot styles and, when allowed to speak, had some memorable promo lines. However, whilst he was making a slight difference to PPV draws and ratings, business certainly wasn’t being transformed by Lesnar. WWE paid serious money to lure Brock back in the fold and they were understandably keen to secure a long term gain for this investment. If he wasn’t going to move the needle substantially, then he could give a welcome leg up to the next big thing. So in 2014, WWE devised a plan. At Elimination Chamber 2014, The Wyatt Family battled The Shield. With a seemingly heel Ambrose missing in action and Rollins incapacitated, Roman Reigns stood alone against all three Wyatts. The air was thick with searing babyface heat as Reigns battled bravely before taking the loss to Bray. Looks, size and skill: Reigns had it all. He was surely the big babyface that would replace John Cena. Now all he needed was the perfect foil. At the next PPV, Wrestlemania 30, the unthinkable happened; Brock ended the streak. At Raw, the next night, Lesnar and Heyman were jeered as they gloated and rubbed salt into the open wound. A major heel was born and the main event of Wrestlemania 31 was in motion. liberating the title, sending Brock packing on his last contracted night in the company. All sound, logical booking that made the investment of resources in Brock seem worthwhile. It all fell apart with two injuries and two debatable booking calls. The first injury was to Daniel Bryan. When he vacated the WWE title the Summerslam match was off and Lesnar lost the chance to send his heel heat into overdrive. The replacement feud was with John Cena, a man who was such a turn off to large swathes of the crowd, that the programme actually turned Lesnar, the hated streak conqueror, into a face. 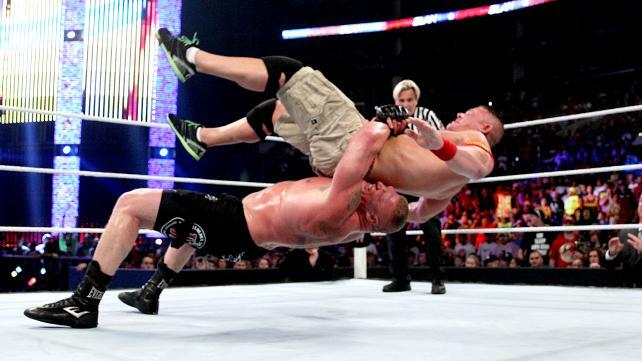 The nature of the match- a glorified squash- would have led to outcry had it been the beloved Bryan on the losing end but with Cena taking the beating, there was outright celebration; fans had waited years to see this happen and their hatred of Lesnar dissipated with each German suplex. So with Brock now a face, Roman’s only chance for Mania 31 was to be even more popular than the new champion. After a so-so start to post Shield life, Reigns was injured and missed three months. Stunting his growth as a performer and connection with the crowd, his return to face Big Show did nothing for nobody. Booed at the Rumble, Reigns was put out of his misery at Wrestlemania by the famed Seth Rollins cash in. The plan to pass the torch was put on hold. 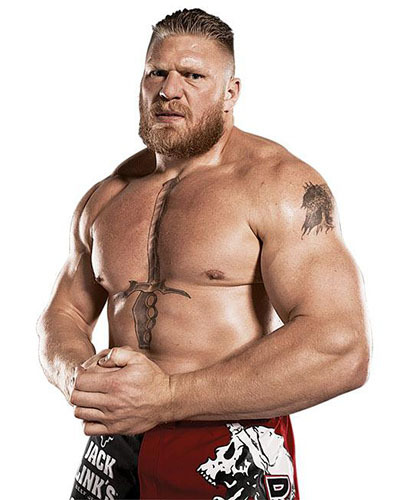 Since ending the streak, Lesnar has failed to win only 5 of his matches: he has lost by DQ to Cena; been the odd man out in the aforementioned Mania main event and in a triple threat to Reigns and Ambrose; been eliminated in a Royal Rumble match and suffered a controversial loss to The Undertaker. He has yet to do a clean and convincing job: to do so now would represent a significant moment in the industry. He is still the man that ended the streak, the man that stood tall in the UFC (despite recent controversy, he legit reputation stands true) and a multi time Champion. Arguably, only Brock Lesnar and The Rock still have the aura and mainstream appeal that could truly elevate a talent to another level. So now the question is when should he lose and to whom? Lesnar is under contract until Wrestlemania 34 in 2018. He could win consistently until this point, amassing considerable momentum, before doing the job in his final match. At this point, he could leave the company and return sporadically in the future for special attraction appearances, always winning to preserve the importance of his conqueror’s victory (in the same way the Undertaker has been booked strong to maintain Lesnar’s status as “The One”). Alternatively the WWE could pull the trigger earlier: have Brock lose before his contract is up- possibly at next year’s Mania- to allow for his subsequent appearance to be a rematch against his vanquisher or a fresh fight that enables him to go out on a win. Either way, for the remainder of his WWE run, it makes sense for him to lose on just one stage - Wrestlemania- and to only one man. But who? Clearly, Reigns was plan A and he could still be considered as an option. A rematch makes sense (neither man has ever pinned the other) but this should feel like the modern equivalent of Hogan slamming Andre: the crowd have to buy into this fully. If Roman is deemed too risky a beneficiary of such a moment, then attention turns to one of three men. down Brock Lesnar (a Heyman-Enzo verbal joust in the build would be greatly appreciated) or Big E hitting his big ending on the massive beast. 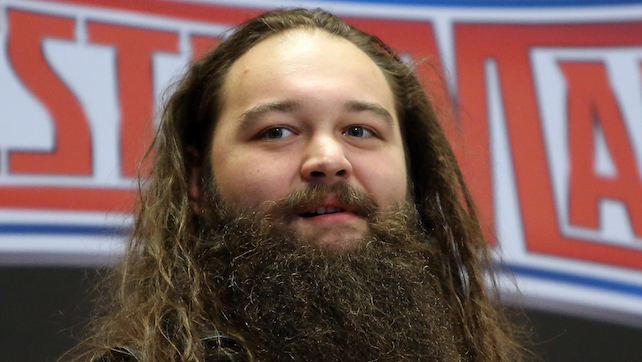 But for me the best option now is Bray Wyatt. Bray is the natural successor to the Undertaker on the roster but has been denied the opportunity to defeat the Dead Man on the biggest stages. The best way to get round this is to beat Lesnar; in doing so, Wyatt usurps the mythology of both of WWE’s hardest hitting legends and cements his status as the new monster character. The heel-face dynamic could work either way with Brock and Bray for WWE to reach their ultimate destination: a main event scene infused with a confident, dominant younger. The conqueror would be conquered and that historic moment would mean more to the business than anything else Brock Lesnar’s impressive career has yielded to date. Words by Sean Taylor-Richardson. Images by James Marston.